Are you communicating the right message to your visitors? Are you communicating your message differently to different people? If you're not, you might not yet know just how powerful even simple personalization can be in terms of visitor engagement and conversion. Put another way, watch this session and learn how you can create personalized website experiences for your visitors to better lead them towards what they seek. Personalized recommendations are, without a doubt, the most powerful motivator to any decision making process. Think about some of your largest purchases – did you have any friends or family members give you a tailored recommendation based on what they knew about you and about the item you were buying (e.g. “I bought this and I know that you would love it to because ______”)? Think about when you’re browsing Twitter, Facebook, or some other social media stream and you click a link that looks interesting to you. It’s unlikely that the link was meant specifically for you and you alone, but you clicked it anyway because it was recommended to you nevertheless. Our websites should be just as warm and friendly to visitors as the recommendations they’re getting from friends. The message we communicate should be personal and intentional. But how do we do that for an audience of mostly strangers? The team at Duda has been working on this one for a long time. I first met them at LoopConf and was very impressed with a new product they had just launched called inSite. inSite is a platform that helps you to deliver customized and tailored messages to your visitors in order to provide a more personalized experience for your website. It is really, really cool. In this session we’re going to learn a bit about how to use inSite to customize a WordPress website and show different messages to different visitors. It allows us to set our targeting based on the date and time of day, the visitor’s location, visitor behavior, and a bunch of other things. Moreover, in this session we’re going to learn why personalization is so important and learn about specific strategies that other sites have used quite successfully. What kind of personalization helps increase engagement and conversion? 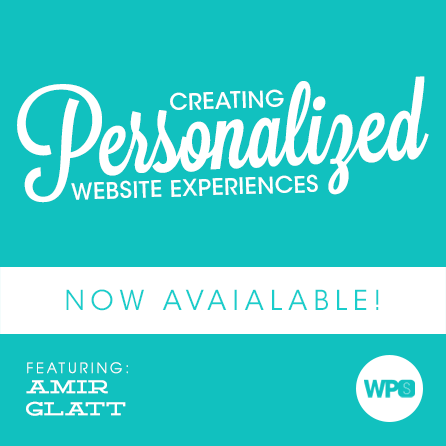 Amir is the co-founder & CTO of Duda and is on a mission to make websites mobile friendly. Prior to founding DudaMobile, Amir worked in SAP, the world largest maker of business applications. Amongst other responsibilities, he founded and managed the SAP collaborative portal project. Amir also holds a BSC degree in Mathematics and Computer Science from Ben Gurion University in Israel.